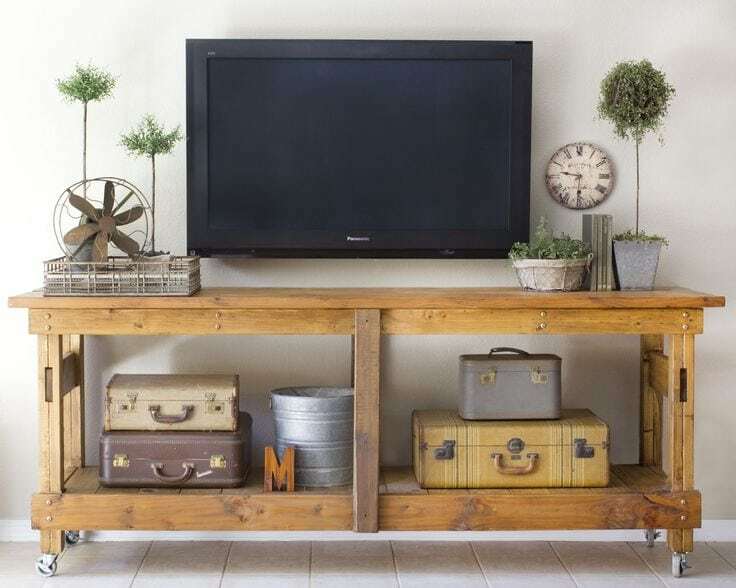 Rustic wood tv stand with wheels. 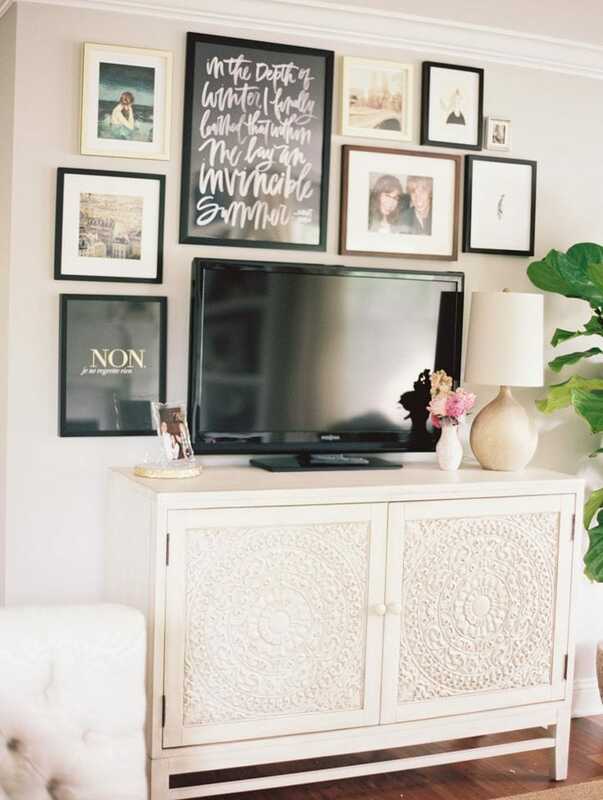 Neutral gallery wall over the TV stand. 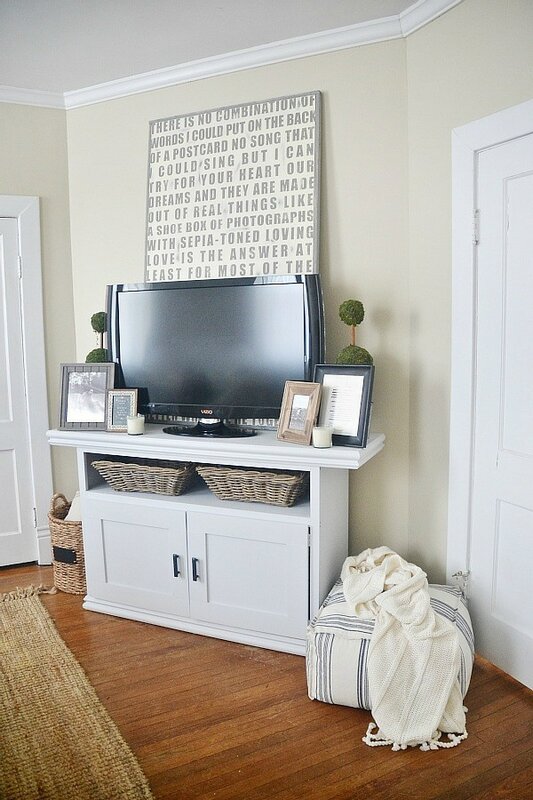 Neutral & quaint TV stand. 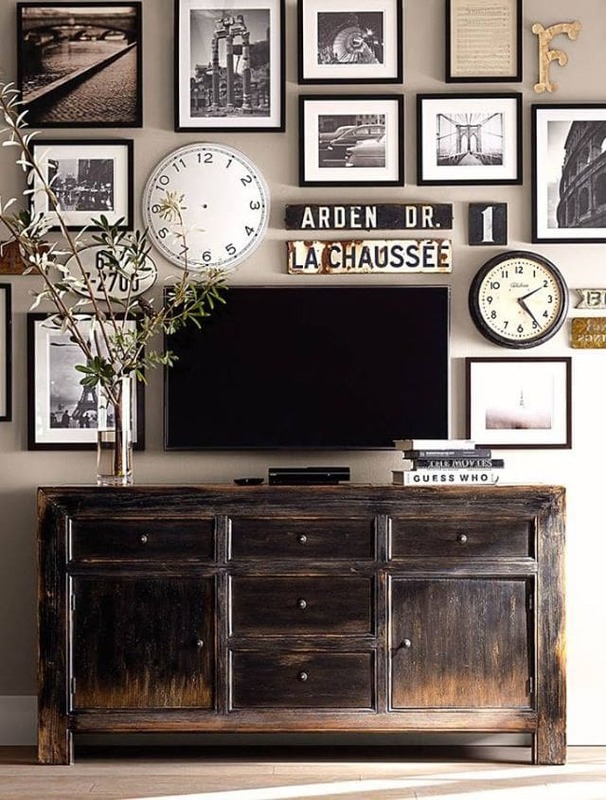 Eclectic gallery wall surrounding the TV. 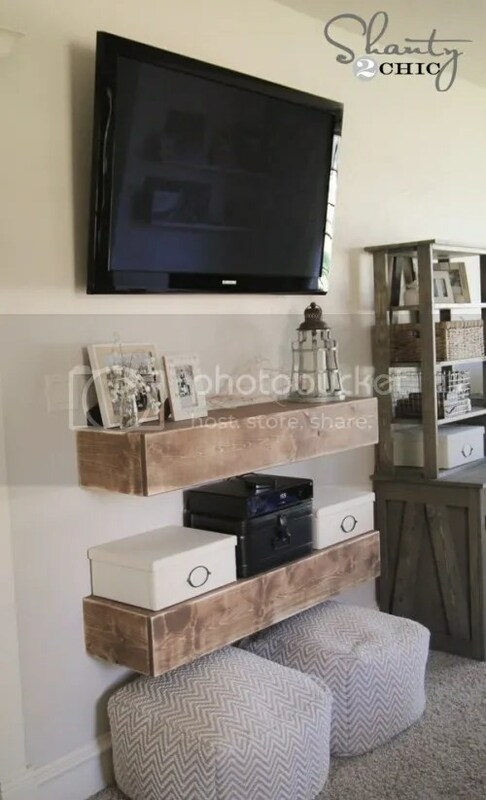 Dresser turned TV stand on a pallet wall. Hidden TV behind cabinet doors. 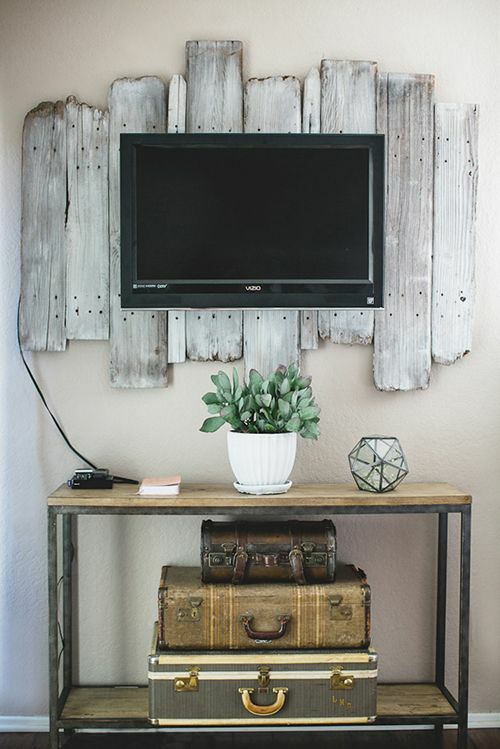 DIY rustic TV stand with drawers & corner gallery wall. 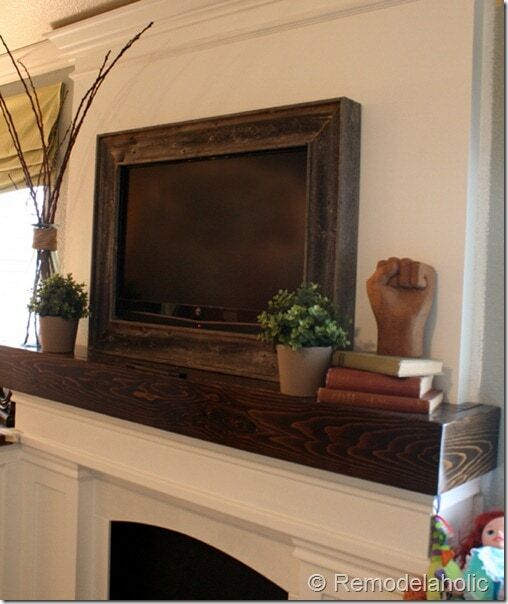 TV hanging in a gallery wall. 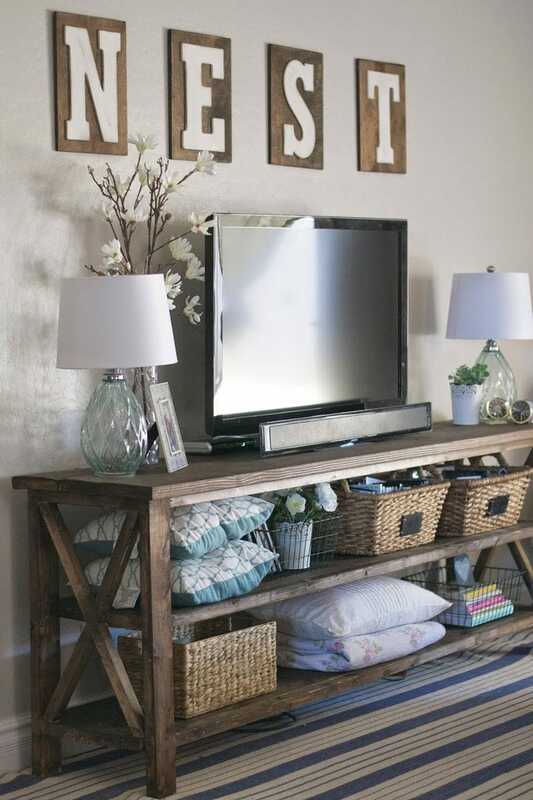 Cozy rustic farmhouse TV stand decor. 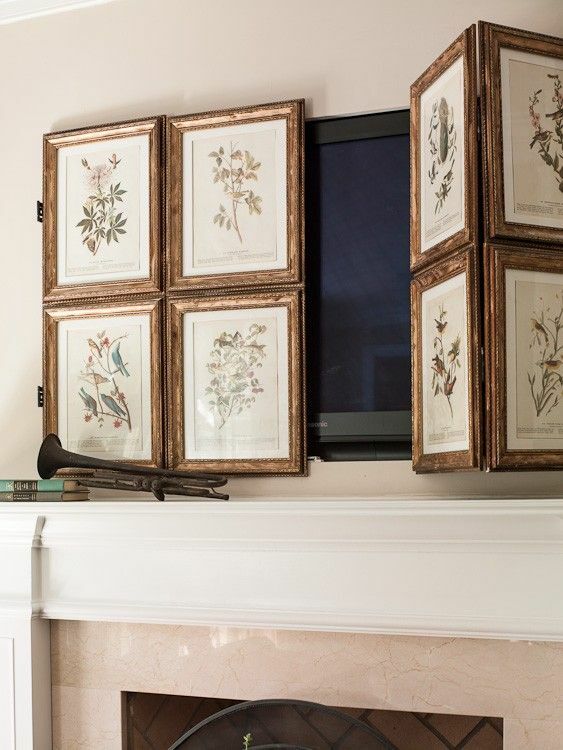 Eclectic frames & topiary TV stand decor. 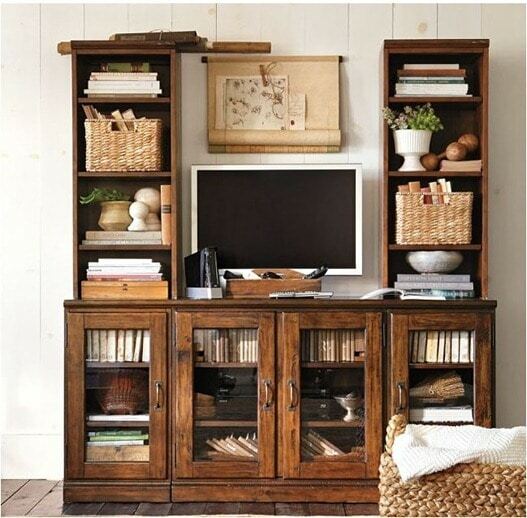 Rustic crate & basket TV stand decor. Or tuck it away in a TV armoire & hid it away. Great post with lots of wonderful ideas! 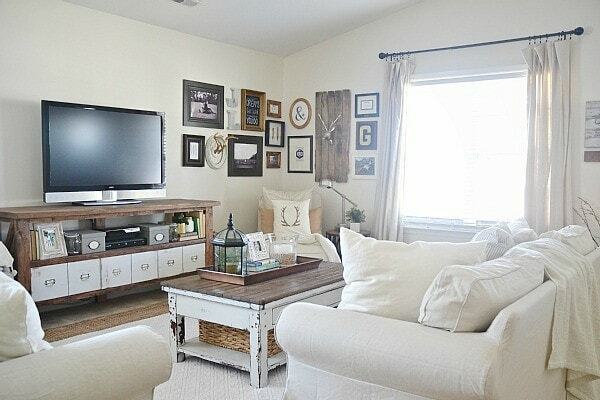 I love the “eclectic gallery wall surrounding the TV”. It’s my favourite of the bunch. 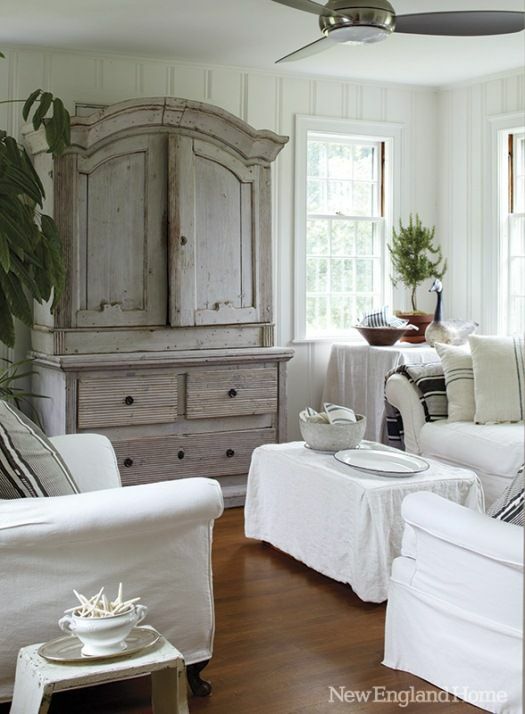 I’m not sure why I’m drawn to it because I normally like very clean, simple, and uncluttered decor. It must be because of the neutral colours that are keeping it “calm”. 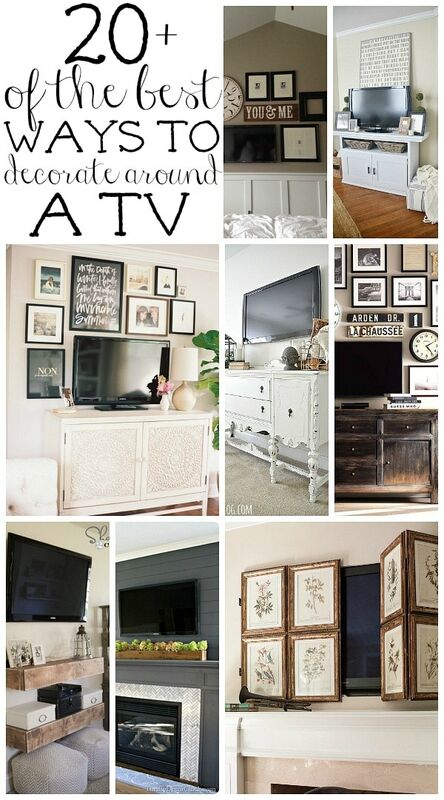 I love a gallery wall around a tv since your eye tends to see the pictures not the tv…great images and ideas! Check out the guys at the Cavendar Diary, their style is different than yours, but they have neat ways of displaying collections around their TV. Perfect timing for this post!! We just moved and im facing this same problem!!! 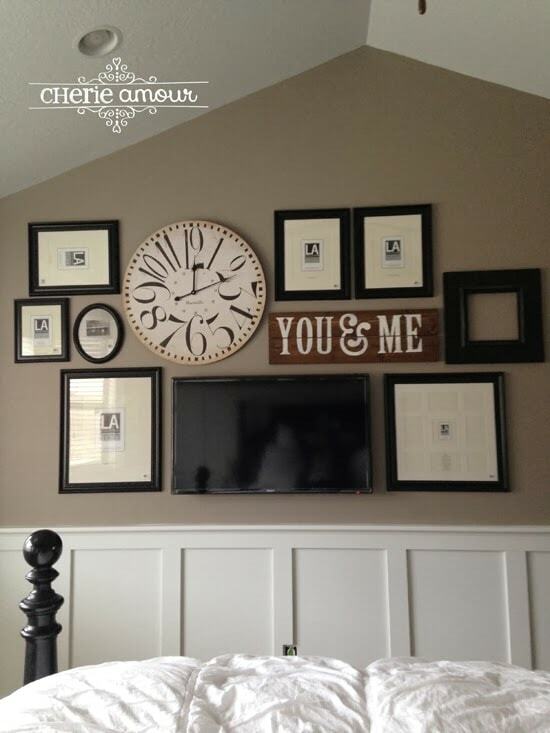 I am LOVING the eclectic gallery wall!!! 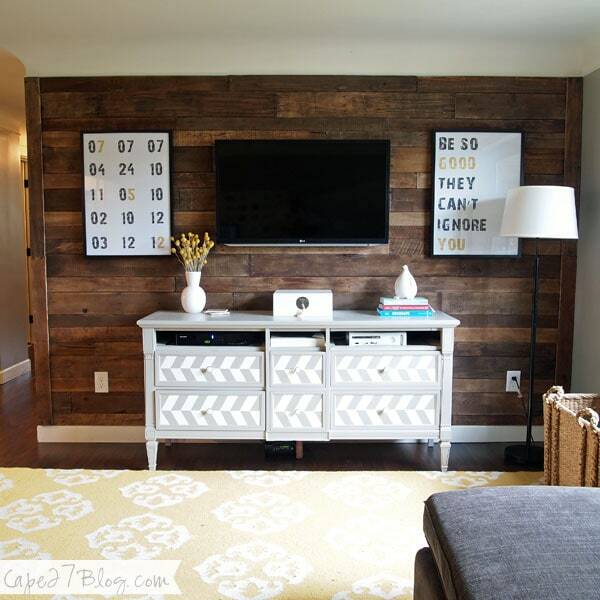 Basically incorporating the TV into the gallery wall!! Going to give it a try. Thanks Liz for the inspiration and to the reader who requested. L-O-V-E this blog, and especially this post. SO many GREAT ideas!!! 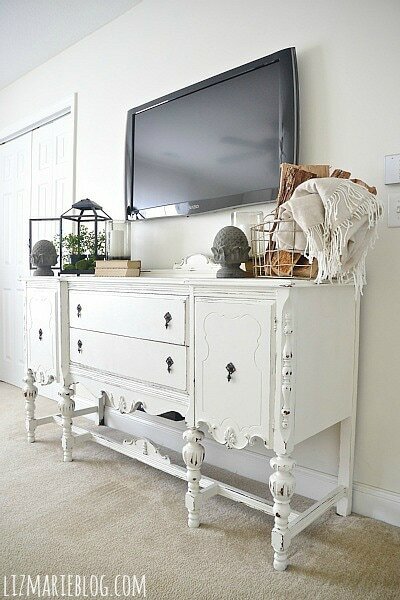 I especially love the coral dresser as a tv stand. 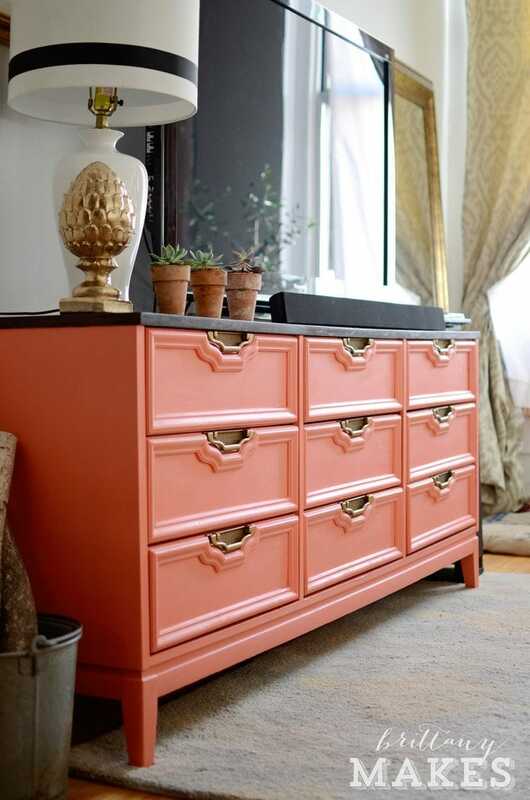 I love coral painted furniture! Love this post!! 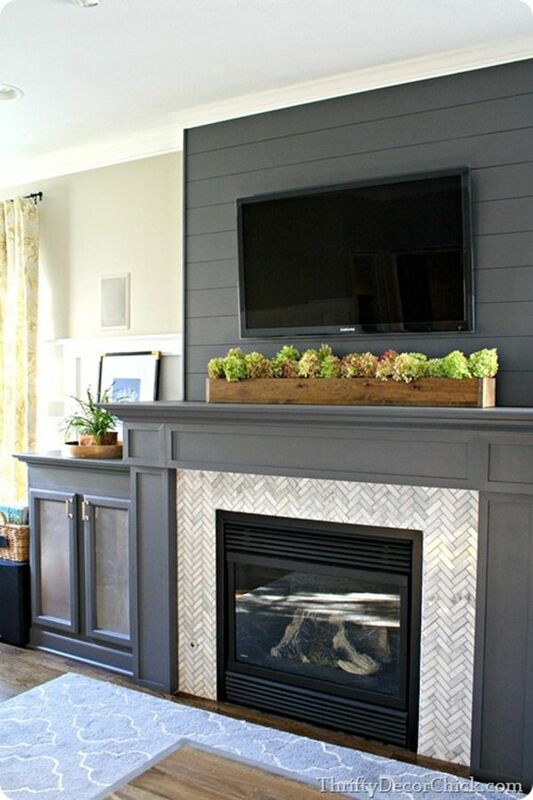 I especially like the gallery walls around the tv. We recently put a wall mount tv in our master bedroom and I’m staring at it trying to come up with ideas. Thanks for so many of them. Love these ideas! I was wondering what you would you do if tv is on a corner cabinet ….in the corer, with a short wall on the side–not sure what to do with it? a gallery? some reclaimed wood arrow s (three arrow points) on the side? My favorite is the botanical prints cover. Or I could use one of the other arrangements using the botanical prints. Umm. Decisions. Decisions. 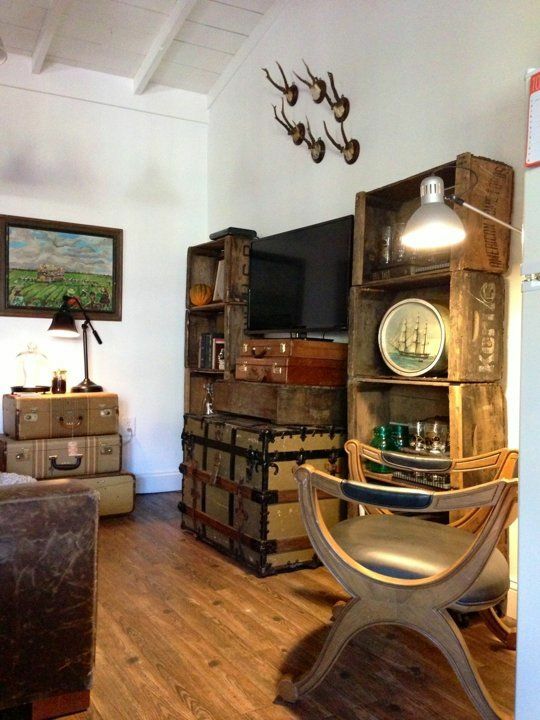 My favs are the Rustic Farmhouse, and the suitcases stacked on the trunk! I just bought an old dresser off of craigslist, and I’ll be giving it a makeover as soon as the weather is consistently warm enough to paint in the garage. 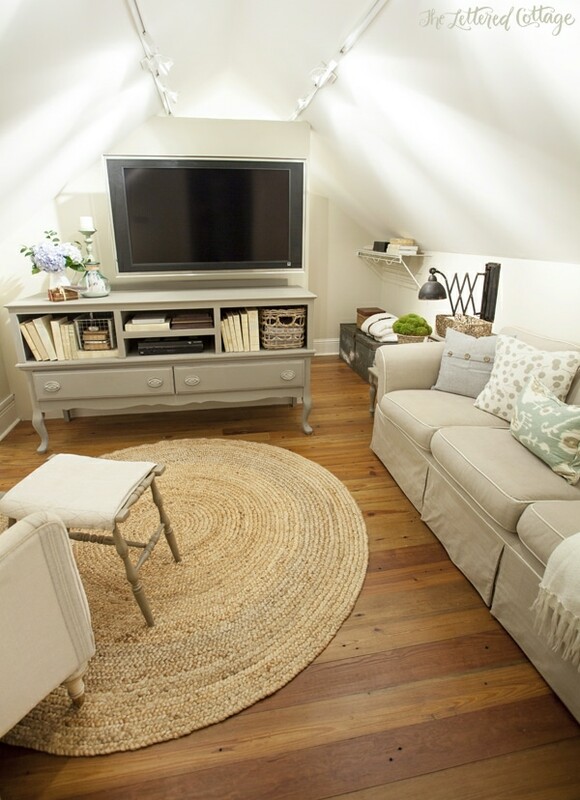 Can’t wait to incorporate some of the ideas you’ve shown! Thank you for this post really insteresting and with a lot of good ideas ! Merci pour ce poste très intéressant et plein de bonnes idées ! off course like your web-site however you have to check thee spelling on quite a few of your posts. the reality nevertheless I’ll surely come baack again. use the cam (ex-spouse: zoom) after tape-recording beginnings. encouraging unique pictures by avoiding the user from supporting the overflow of common digital imagery. well as for numerous, the best option because of this. each with its own low-cost small lens at focal sizes between 35 and 150 mm. on different points and also taking various exposure levels. I will demonstrate you how to have 500 words blogpost less than 4 bucck pinch my name up there.